Looking for the best fans for college dorms? While there are plenty of options to choose from, shopping can be a hassle and take hours. Dorm rooms are limited on space and being in college often means you’re short on money. But don’t stress! You can sleep, study, and enjoy college life in comfort affordably. To make things easier, I’ve put together a list of 5 of the greatest (and best-selling) fans for college dorms. There’s also a helpful buyer’s guide below. 2. What is a tower fan? 3. How do tower fans cool your room? College dorm rooms are small on space and are a bit of a challenge because of it. Why not make the most of the space you have? When you’re sharing a limited amount of space with a roommate, buying just any fan isn’t practical. You’ll have to get something that works well and doesn’t take up too much of your precious space. I recommend tower fans as they’re more space efficient than others. Unlike traditional fans, they’re a better fit and offer benefits others don’t. They’re also great for making the room cooler and more comfortable – especially if you can’t control the air conditioner settings or if none is available. Unlike standard box or tabletop fans, tower fans have a unique design. They work using a tall, vertical placed cylindrical rotary fan assembly. This cylindrical fan rotates and blows air horizontally, forming a tall “wall” of air. 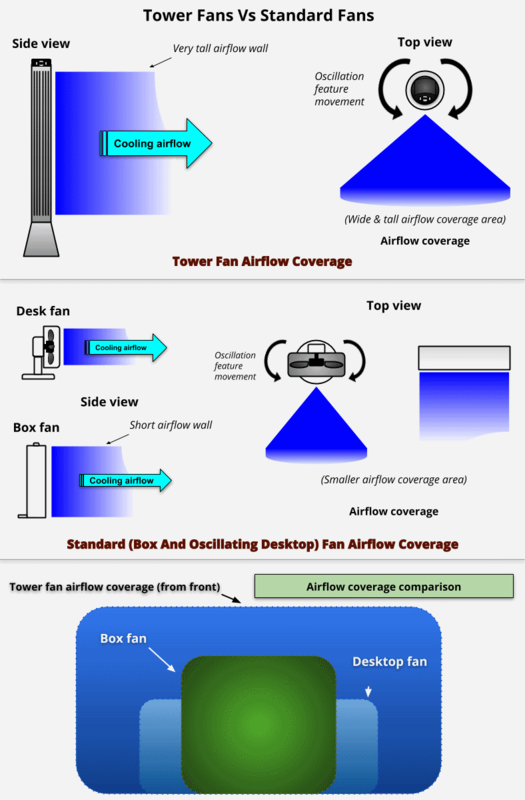 While traditional fans are often inexpensive and work well when pointed directly at you, tower fans are better at distributing more air over a wider area. They’re often more quiet as well. Made up of a vertical design, tower fans are unique in that they don’t use a standard blade design like box, tabletop, or ceiling fans do. Basically they have a cylindrical-shaped fan assembly with curved blades that cover every portion of the fan’s center. 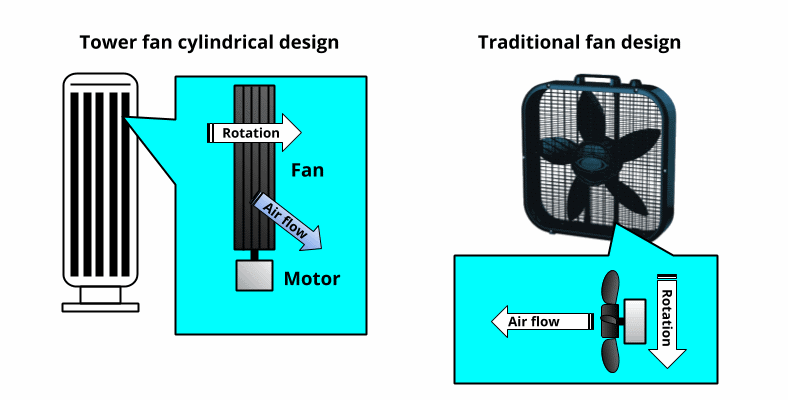 Tower fans work by using a vertical fan design driven by a motor to blow air in a tall, horizontal pattern. Unlike traditional fans they don’t necessarily have to be positioned to blow directly at you to keep you cool. The blades within the fan are more of a curved design which look like a circular pattern if viewed from the top end portion. While standard fans like box and desktop models can give some room cooling, they typically don’t have the air coverage that tower fans do. For example, box fans have a fixed direction and must be turned exactly where needed. Desktop fans that oscillate have more area coverage, but still can’t cover as much area as a tower fan. Although you can find many inexpensive fans that will cool small areas like a college dorm room a bit, tower fans are easier to use. Think of them as more advanced fans that use a better design resulting in better performance, advanced features, and taking up less valuable space. Regardless of the features, the biggest advantage of a tower fan is how they cool a dorm room better than other fans thanks to their better airflow coverage. How do tower fans cool your room? Tower fans are able to cool both you and your dorm room using the principle of convection. That is, they move air across surfaces and thanks to the physics of heat transfer, heat is removed from your body & room objects. That gives the feeling of cooling. They also do a good job of circulating air in a dorm room, too. Earlier I mentioned how tower fans work by turning a cylinder-shaped fan assembly. The tall and vertical design they use creates a tall vertical stream of air blowing in a room which passes over both your body and room objects. By doing so they cause you to feel cooler as they remove heat. The scientific name for this principle is called forced convection. While it may sound fancy, in reality it’s pretty simple! Cooling by forced convention means fans force air across surfaces which transfers heat away from those surfaces. Convection means moving a liquid or gas (in this case air) to transfer heat energy. Here’s a great example: most personal computers have a cooling fan which removes heat away from the hard-working central processor (CPU). A well-designed fan with sufficient speed can circulate air throughout a room and keep it constantly moving for added comfort. 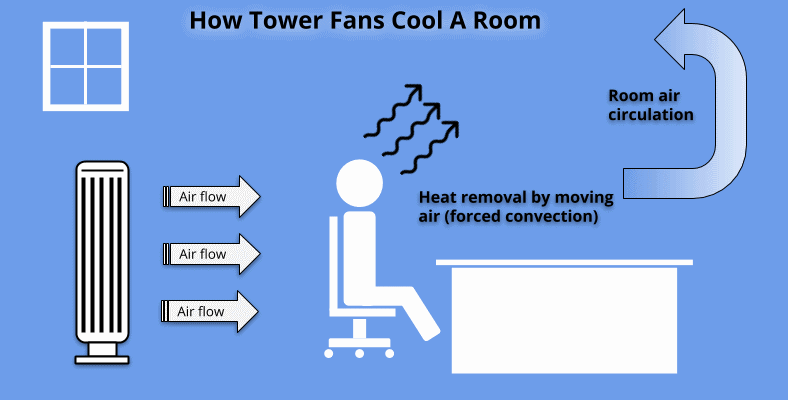 This is especially true as most tower fans have an oscillation (side-to-side movement) function. One fantastic benefit is the amount of money you’ll save by using a tower fan versus using an air conditioner (AC) unit. While college dorms may have AC, often you won’t have the option to change settings to your preferred temperature. Most air conditioners also use a lot of electrical power as they have to power not only a fan but and also the compressor used to circulate refrigerant. 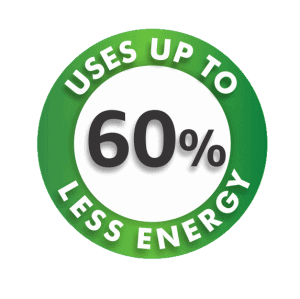 However, tower fans can work with up to an amazing 60% less power than an air conditioner! For added benefit, you can also use the fan to “boost” an existing AC unit’s cooling ability and cut power consumption. The fan will help redistribute cool air from the AC unit throughout the room, aiding in cooling even more. Some people use both as they can turn up the temperature setting on the AC unit and reduce their electric bill during hot seasons. Many of the models listed below also offer automatic shutoff timers so they can be left unattended and won’t run 24 hours a day. There are some excellent features available on quality tower fans you should be aware of before shopping. For example, a remote control is an excellent option! 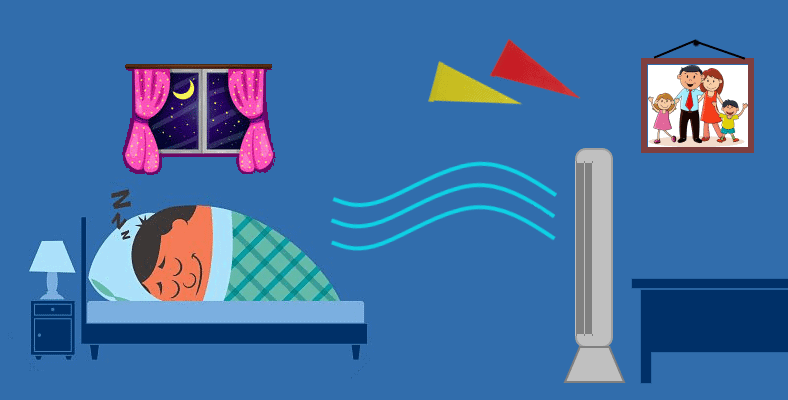 You can change fan settings without having to leave your desk or get out of bed at night. You’ll definitely need to pay attention to buyer ratings as in my experience poorly designed fans are louder, less effective, and won’t give you the same cooling effect as lesser models. It’s simply not worth it put a cheaper fan in a dorm room and then be miserable with the results! Some models offer an air cleaning feature such as an ionizer to remove a small amount of unwanted irritants or allergens from the air as the fan runs. While it’s a nice addition to have, I don’t recommend you make a buying decision based on this feature. That’s because fans simply aren’t designed to act as efficient air cleaners the way a true air purifier can. However, there are a few exceptions, like this wonderful oscillating Honeywell AirGenius 5 fan and air cleaner I reviewed. Some of the best brands offer much quieter operation than standard fans. As a matter of fact, some offer a “sleep mode” specifically for this reason. This way you can sleep at night without fan noise disturbing your much-needed rest. Others offer a way to dim the control or indicator lights to avoid that very annoying light that may wake you up. As a light sleeper myself, this is something I really value! You’d be surprised how easily your eyes can detect even dim lights in a dark room. One reason is the human eye is more sensitive to blue light which many modern electronics use. An auto-off timer is a very convenient feature I really love. With it, you can set the fan to turn off automatically after a selected amount of time. It’s great for leaving it running while being out on errands or in class and not having to worry about turning the fan off. The timer settings available vary from model to model. 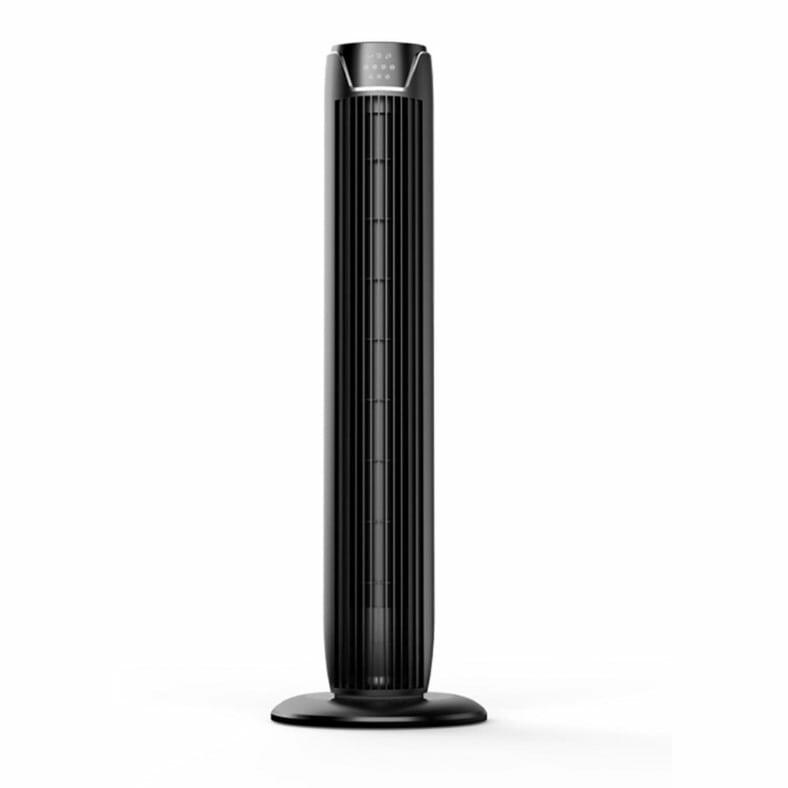 Unlike standard fans, the oscillation feature is very common on tower fans. With it turned on the fan will move side to side in a steady, slow fashion and distribute a wide and large amount of air in your room. It’s a very important feature! Most within a range of aboutt 60 to 90 degrees in width, depending on the particular product. 1. 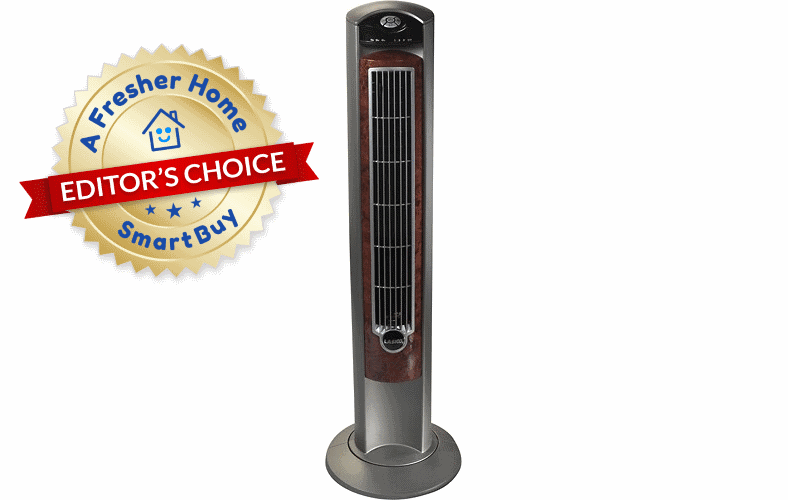 Lasko Wind Curve – A best-selling winner. Great for college dorms! 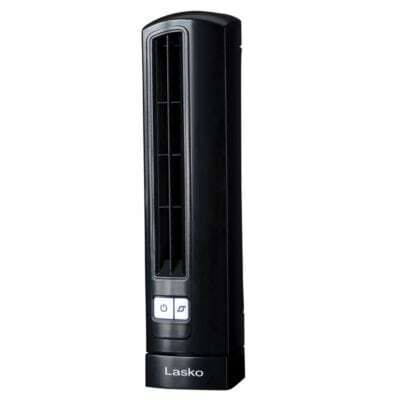 Lasko is a giant producer of some of the most popular fans you’ll find anywhere. Measuring a tall 42.5″ (108 cm) it makes great use of limited floor space. Just place it where you have about 4 feet (1.2 m) from nearby walls or furniture for best performance. The oscillation function will produce a generous and wide area of airflow for great cooling and comfort. Your dorm room will fill with pleasant, refreshing air immediately. The Wind Curve provides a simple control panel with LED indicator lights to show the operational status and timer selection. 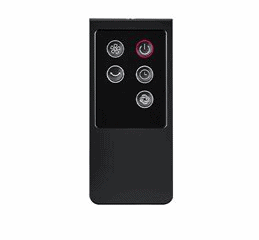 Electronic push button controls are easy-to-use and reliable, with a good “feel” you’ll like. Just push the fan button to rotate through 3 fan speeds. The timer button lets you set it and walk away. Touch the oscillation button to engage the wide-sweeping side to side motion. It’s also a quiet one as well. Great for sleep time or when you need to focus and study without being disturbed. 3 fan speeds are available by touching the clearly labeled push button controls on top. Want to set it and walk away? That’s easy! 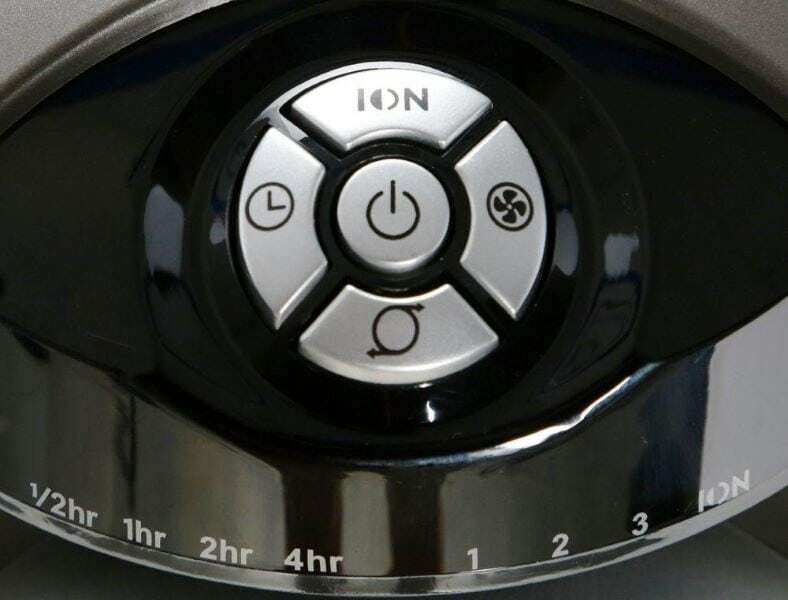 The handy auto-off timer allows you to choose from 1/2, 1, 2, or 4 hours of operation after which it turns itself off. For added air quality, an optional ionizer feature is provided to reduce airborne contaminants in the room while the fan is running. A sleek remote control (included) stores nicely on the rear of the unit when not in use. No need break your stride when studying or relaxing…just push a button and the fan changes settings. There are a few minor quibbles. I would have preferred more fan speed settings were available as well as more timer options. Overall, however, it’s one of the best available today. The quality is excellent, it cools a room really well, and it’s great-looking, too. I definitely recommend to anyone who’s looking for one of the best. The included remote control works well and is especially great to have. For these reasons, it gets our Editor’s Choice award as the top recommended tower fan for your money. Stay cool with the best! Head over and find out why it's an incredibly popular seller at Amazon. The sleek and advanced QuietSet 8-speed whole room tower fan features the same Honeywell design and performance quality I’ve reviewed in the past. During many of my tests, I’ve found their air purifiers and fans to be some of the best for your money. The QuietSet proves once again that good design and quality components don’t have to cost a lot. With it, you’ll get many of the same features as other tower fans listed here, with a few you won’t get…and that’s you’ll really love! Standing at 40″ (101.6 cm) tall it looks great in any college dorm or office. Hit a button on the simple – and incredibly convenient – remote to change functions without having to stop what you’re doing. No need to interrupt your work or leisure time after a hard day! To avoid losing it, the remote stores neatly in the rear when not in use. A nice little remote control is included, too. 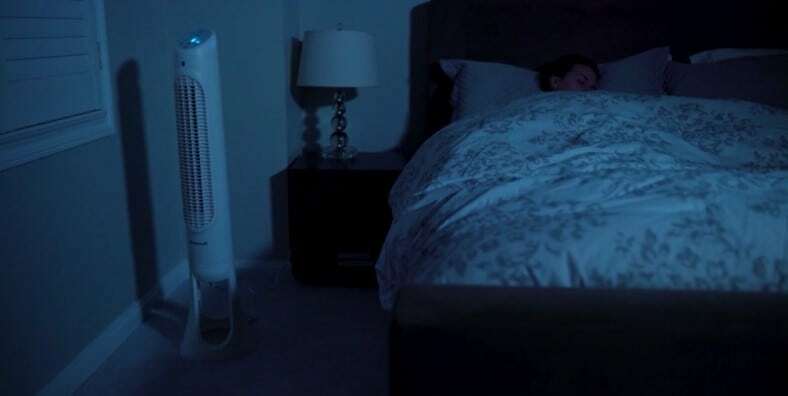 While it doesn’t allow more advanced operation like on the more expensive Lasko Wind Curve fan, it’s a great feature and lets you adjust comfort levels and fan speeds with zero hassle. Turn it on, off, engage the oscillation function, or change fan speed levels from across your room. You get one of the largest fan speed ranges available as it provides 8 fan speeds to choose from. The control panel is one of the best I’ve seen on any tower fan. A sleek and advanced display shows the current fan mode and speed level. A dimming feature means you can adjust the unit to 5 different levels if you’re a light sleeper like I am. The auto-off timer allows choosing 1, 2, 4, or 8 hours of operation time before it turns off automatically. It’s a great way to let the fan run and then shutoff to avoid using up energy when you’re not around. 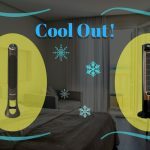 The easy-touch electronic controls add a distinct touch of class to a surprisingly affordable fan – well below the price of many competitors that don’t offer the same nice fan display. Need to move it to another spot in your dorm room? Not a problem! There’s a built-in carrying handle on the top rear as well. One of the QuietSet fan’s best features is the low-noise operation. You are assured of a cool and quiet night time. Don’t worry about bright lights, either. Thanks to the illumination dimmer feature you can adjust control panel lighting to your preference. If you’re looking a great fan and an excellent value, look no further. It’s a great looking, great-performing fan that cools well and is really quiet. I’m a big fan of the QuietSet and find it to be a treat to use. Although it would be nice to have more features on the remote control, that’s a minor complaint, given how much you get and how well it performs. Assembly is easy, too, so there’s no need to worry about having to spend much time getting it up and running. 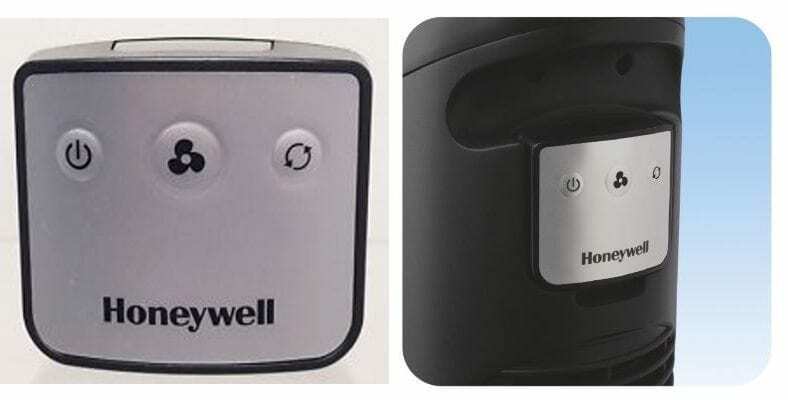 Just like with other Honeywell products, instructions are clear and well-written. There are only a few pieces you need to assemble once it’s out of the box. Ultimately, the Honeywell QuietSet is a great value and one of the best tower fans you’ll find below $70 or so. I’m honestly impressed with the performance, build quality, and so much more. Get a good price for an excellent fan with plenty of features! Find out today why it has some of the best buyer reviews you'll find over at Amazon. 3. 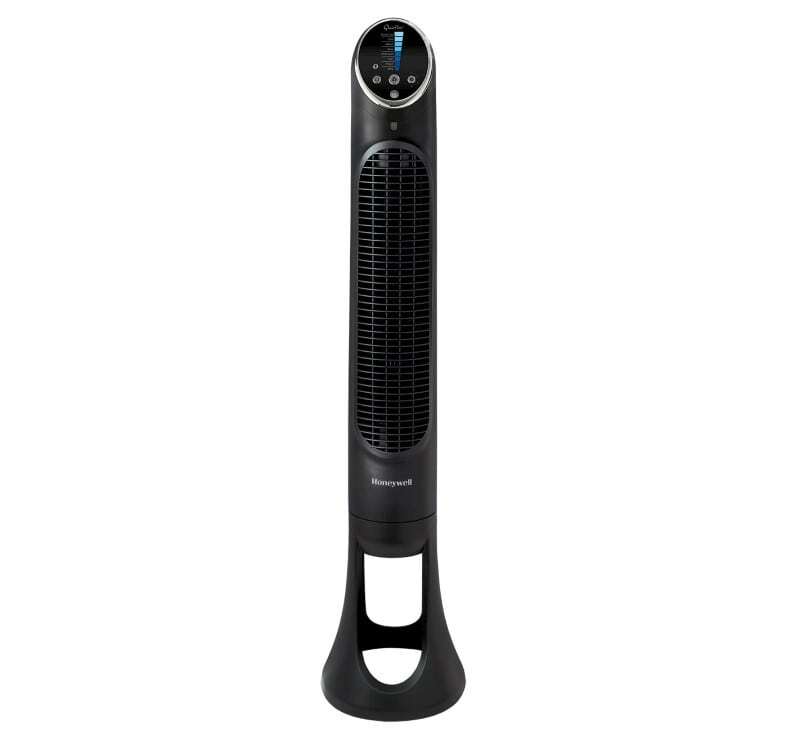 Lasko Air Stik Ultra Slim Tabletop – A lower-priced tower fan that’s great for desks and table tops in dorm rooms! Got a college budget and can’t spend a lot, but you still need a compact way to feel cooler? The good news is that Lasko has you covered. The Lasko Air Stik Ultra Slim tabletop fan is perfect for small spaces just like your college dorm room. You’ll find it just as well-made and dependable as Lasko’s many other popular cooling fans. At about 14″ (35.6 cm) in height, it’s big enough to give you the comfort of good air flow and yet small enough to not eat up precious space. Priced at well below $50, you might think you’ll be compromising on quality…but you won’t be at all. It’s a great match for a desk or table in your dorm. Featuring backlit electronic controls, it’s easy to use in the dark or during daylight as well. Choose from 2 quiet fan speed settings that are perfect for you or you and your roommate. Keep it anywhere you have a few inches of free space. Keep it right on your study desk if you like! It fits in nearly anywhere you need it to! A great choice for dorm rooms, the Lasko Air Stik offers simplicity and compact size without costing a lot. Sleek and compact, the Air Stick works great just about anywhere. Despite its small size, it features an oscillation function just like bigger models to offer a nice 60 degrees width of comforting airflow. The design distributes the soothing air much more effectively than its fixed position competitors can. The patented blue safety plug is Lasko’s own safety design. Built into the electrical power plug, a safety mechanism will shut off power to the fan should an electrical overload or other unsafe condition trigger it. As great as it is, there are a few compromises to live with for the price. There’s no remote control available and no auto-off timer feature either. However, at this price range you’re still getting a great fan that performs well and is well-made, too. When it comes to compact fans you can fit in limited space (especially dorm rooms) there are lots of choices out there. However, the Air Stik is just a better choice all around. Many happy buyer reviews back up my opinion as well. Don’t hesitate to check it out! You can find out why so many people love it and see the current low price at Amazon. If you’re not already familiar with Holmes line of home air quality products you’re missing out. I’ve test several and I’ve been happy with what I’ve found. The produce some very nice – and affordable – products you should definitely consider. The wonderful Holmes HT38R-U tower fan is no different and is definitely one of the better choices for under $65 or so. It’s one of the easiest-to-use tower fans I’ve found anywhere. You’re not skimping on quality, value, or cooling ability, however! It’s a great compromise between all 3. At about 32″ (82.3 cm) in size, with the lovely satin black and silver finish accents it is honestly one of the best-looking fans I’ve tested. A solid and wide base measuring 11″ (23 cm) in diameter adds a stable, supportive way to keep it upright and still save on valuable floor space. 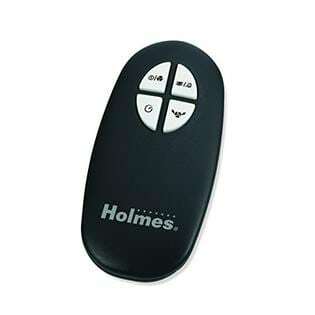 The Holmes HT38R-U features a classy yet simple control panel with clearly marked electronic controls. Just push a button to rotate through 3 fan speeds. Likewise, push the other buttons to start the oscillation feature, set the auto-off timer, or switch power on or off. Internal lights show the current mode at a glance. 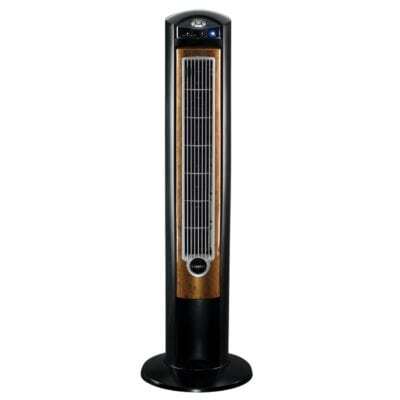 It’s a very modern and sharp-looking tower fan you’ll enjoy owning. Even better, you’ll still get some of the same features found on more expensive competitor models. For example, there’s an auto-off timer provided with 1, 2, 4, or 8 hour options to choose from. Simply push the timer selection button and it will begin an hourly countdown for automatic shutoff while you’re asleep or busy with work or class. The oscillation feature provides almost 180 degrees of wide air flow to fill the room with soothing and pleasant cooling. Turn it on the fan will gently (and quietly) move from side to side unattended. Although it’s affordable, the HT38R-U also includes a convenient remote control. 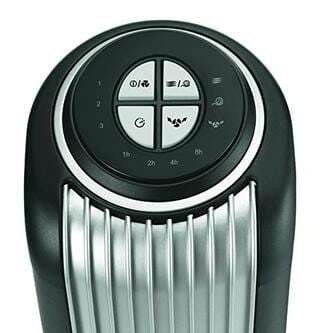 With the remote you can control the major functions including fan speed, on/off, oscillation, and the timer. The included remote control works well and is easy to get used to, as it’s very similar to a car remote. It feels good in the hand and isn’t bulky or hard to deal with. I also love how great it is to not have to get up from what I’m doing to change settings! To round things off, you’ll also appreciate the nice little carrying handle built into the body as well. It’s easy to move around and place it where you need it the most. There’s no need to spend a lot to get a great fan and keep cool in your dorm room. The Holmes HT38R-U really is a smart choice for those who want a lot without paying too much. Don’t just believe my opinion, however – check out the thousands of happy buyers who love it as well. You can’t go wrong! Have a look today at this great tower fan that many people report really enjoy using. 5. Pelonis 36″ FZ10-17JR – Elegant design and feature-packed. Keep your dorm room cool for under $75. You might not have heard of Pelonis, but it’s time to learn more. While you may find many other tower fans to choose from, the Pelonis FZ10-17JR oscillating fan is a hidden gem worth checking out. Sleek, elegant, and sophisticated-looking, it’s a nice change from budget competitors out there. Front-facing illuminated indicators show the operation status and dim automatically after 30 seconds to avoid disturbing you in a dark room at night. 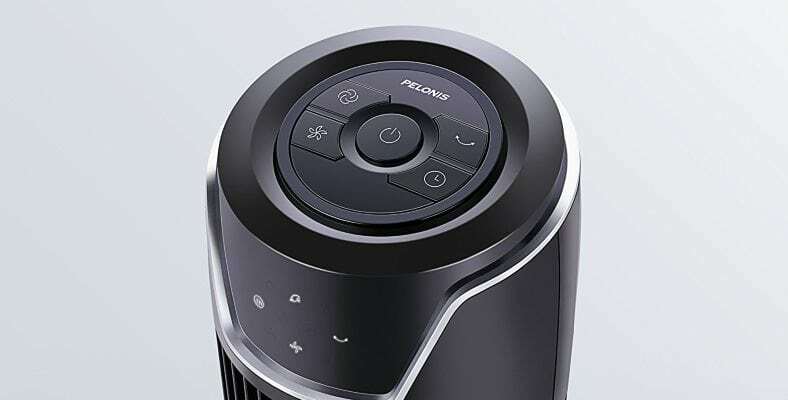 The Pelonis tower fan includes a compact and handy remote that allows you to control most functions from across the room. A compact and simple remote control is included, although the battery is not. The remote is easy to use and allows you to control essentially all the functions at your fingertips. The remote, while a bit basic unlike some competitors, works reliably. It’s great to have those nights after you’ve had a full day of classes and don’t feel like having to fiddle with the settings. Controls are well laid-out and sensible with the top-facing push buttons provide good tactile feel and operation. I definitely don’t have any complaints here, as they’re responsive and work well. I’m happy with them (you can often tell a lot from how buttons feel, I’ve learned). The oscillation function works well, moving with about 60 degrees of coverage width side to side. Combined with the 36″ (91 cm) of height, I found the Pelonis does well at providing pleasant airflow that won’t disturb you with noise. Speaking of pleasant: the fan is indeed very quiet and one of the better ones for its price range that I’ve tried. The sleep mode offers a special low-noise level especially for night time use. The 7 hour auto-off timer allows you to set the fan for automatic shutoff later. It’s a wonderful feature to have at bed time or when you’re doing other things. Assembly is one of the easiest I’ve found – no screws required! It only takes a few minutes to get up and running, so there’s no need to worry about any inconvenience there. Another feature I like is the power off memory function. At next power up the fan starts right back where you left it last time. Very nice! Although I do have a few tiny complaints (no battery for the remote, only 3 fan speeds/modes, no digital readout scale) I still can’t deny how much of great product it is overall. It’s a good value for the money and looks great. If you’re looking for great cooling and quiet operation that’s not expensive, it’s well worth checking out. Take my advice – go have a look at why so many people recommend it as well! 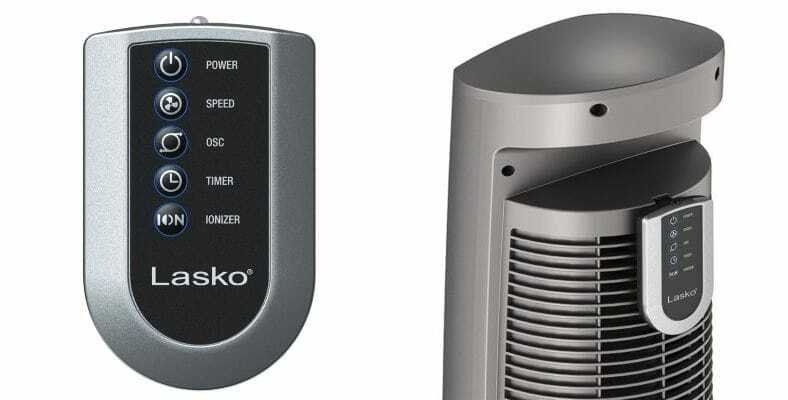 The Lasko Wind Curve is simply one of the best fans you’ll find. It’s so good I awarded it the Editor’s Choice Smart Buy label. Without a doubt, I recommend the Lasko Wind Curve as the first choice for your college dorm cooling needs. As it’s a well-made, good performing, and reliable product I couldn’t pass up rating #1. It’s also one of the single highest selling fans sold today! It cools well, offers great operation, and is easy to use. I like the remote, too. At well below $100, I think it’s within the budget of many buyers. It will also look great in any dorm room and you get 3 attractive styles to choose from. After testing and comparing different models, I’m sure you’ll love it as much as I did…especially if you’re a light sleeper (like me) or don’t want a fan that will distract you with noise. While it’s not the cheapest of our list, it’s simply one of the best you’ll find under $100. The reviews are great and you'll find a better deal on it over at Amazon. Need a fan for your dorm room, but need help with allergies, pollen, or other air quality problems? Be sure to find out more about the Honeywell AirGenius 5 fan and air cleaner I tested and reviewed here. You’ll find more about humidifiers, air purifiers, and how to use them at my Information page.